Parks Canada makes no provision for anyone to report a mistake in its website. It almost appears that Parks Canada's management is unwilling to face the possibility that a mistake could possibly appear here. No doubt they do take great care to get it right, but there's no way such a large and diverse resouce could be wholly free from errors. There should be official recognition of the possibility of an occasional error, with the provision of a way for that error to be reported, followed by appropriate checking and then correction. Some errors, such as a wrong date or wrong geographic location for an historic event, or even a spelling mistake, could be quite simple to verify and correct. I know of two glaring historical errors that appear in the Parks Canada website. They've been there for years with no prospect of getting them straightened out. 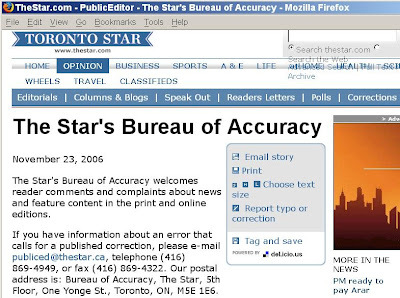 Here's an excellent role model, that Parks Canada would do well to emulate — The Toronto Star newspaper gives prominence to The Bureau of Accuracy (see screenshot below), with a clear invitation to tell them about a mistake: "If you have information about an error that calls for a published correction, please" send an e-mail, or phone or fax, or mail a letter. An archive of recent corrections is available. Toronto Star corrections webpage. For a full-size view, click on the image. 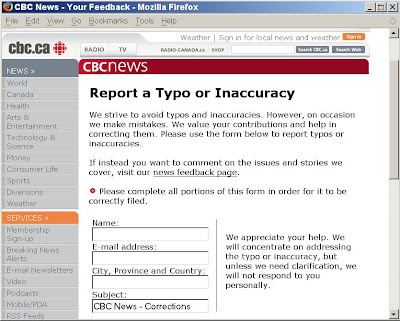 CBC News corrections webpage. For a full-size view, click on the image. The only thing missing here is an archive of recent corrections, similar to that provided by the Toronto Star (above).